This might sound strange, but these brownies actually come out rich and fudgy. They are low fat, high in fiber and protein and no one would know there are beans in them. I calculated these with a box of Pillsbury Chocolate Fudge Brownies, but I plan on buying reduced sugar to see if it lowers the points and still taste as good. Points may vary depending on which brand you use. Open can of beans, drain and rinse well. Put beans back in the can and fill can with water. Put beans and water in blender until smooth. Mix pureed beans with brownie package mix. DO NOT add eggs or oil. Spray baking dish with Pam. Cook brownies according to package directions. I joined Skinnytaste because I want to be healthier. Gina Homolka, your intro states that your food philosophy is to eat seasonal, whole foods. Packaged brownie mix— that’s not whole food. I want recipes that contribute to good health, not recipes that use products containing chemicals & preservatives. “Whatever we are eating or drinking is either contributing to our wellness, or to illness & disease.” Please let me know if the majority of your recipes contain packaged or prepared foods, or whole foods. Thank you. Healthy eating is a fine attribute; so are courtesy and tact. There are plenty of recipes here that use whole, seasonal foods. You don’t have to get on some high horse just because you found one recipe where she uses a shortcut. Many of us need shortcuts every once in a while. I think the addition of black beans to an otherwise very “unhealthy” box of brownie mix is genius. I made mini muffins. 15 minutes if you like them moist, 20 if you like them crispy. I could have eaten all of them. 🙂 Used a vegan mix (duncan hines decadent California walnut) to take to a work event that needed vegan food. Just made these. . Wow are they good! Will be making them often! I made these last night and they came out pretty well. I wasn’t sure if the water in the bean can took the place of the water in the brownie box recipe, so I mixed the beans in first. The batter was a little too thick, so I added some water (about 1/8 cup when the box calls for 1/4 cup). My oven is not the most consistent, but I probably added 13 minutes to the total baking time it had on the box. Even at that point, the toothpick was only coming out clean on one half of the pan (I used a 9×13″ pan). I added some chocolate chips to the batter and some walnuts on top. I may try again, but the texture was not quite right. Thanks for the idea! I was yolk-free for a short time and had a difficult time baking things without eggs. 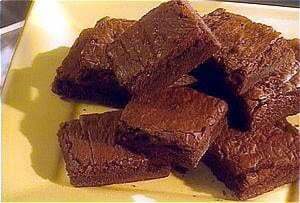 If I use BettyCrocker brownie mix low fat fudge a boxe. 440gr it will be ok?or I have to take mabe 1 boxe and a half? Just tried this. They are really good! I used Betty Crocker chocolate gluten free brownie mix. What size pan do you use? This recipe says to use a 9×13 pan but the recipe on the back of the Pillsbury sugar free brownie mix say 8×8 or 9×9. Which do I use?? 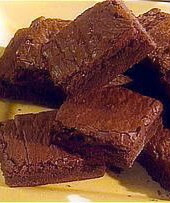 Made today with Pillsbury Sugar Free Brownie Mix. Came out pretty good. I will try it with regular mix but my husband can’t have the sugar. Thank you Gina for this great idea! Did you use a 9×9 pan like the back of the box says or 9×13 like the skinny tase recipe? Just tasted my brownies and they are a chocolate overload! I guess I will tone them down with some Cool Whip (oh, darn!). Thanks for the recipe. I had the sugar free brownies, but no black beans, so I used red kidney beans. The batter tasted good, so wish me luck on the finished product. Can’t wait for them to be done. BTW, I call the recipe that makes the 36 brownie “mini muffins” Best Black Bean Brownie Bites! ? 1. I add 4Tbsp Nestle Semi-Sweet Mini Morsels. Also, different black bean brands vary; my best results are with Bush’s Best Reduced Sodium Black Beans. 2. Instead of using a square baking pan, I bake these in mini-muffin pans. A #40 (small) scoop works perfectly for this! 3. You get 36 mini brownies: 2 SPs if using the Pillsbury Sugar-Free Mix; 3 SPs if using the regular Pillsbury milk chocolate brownie mix. Make sure you are using about 18oz of either mix; this will require 1-1/2 boxes of the sugar-free variety. 4. Bake for about 25 minutes. You get a whole bunch (36) of chewy, sweet, and satisfying chocolate goodness! I freeze them in batches of 8 or so, then thaw them as needed. Do you spray the muffin tin with cooking spray? How did you calculate the points? My calculations with the ingredients are coming out much higher. I’m having the same issue because the nutritional info on the package for just the brownie mix is only for 1 serving….you start adding that up for the whole pan my smart points are much much higher. What am I missing? Did anyone else have the problem with the points? I cannot get down to 4 FS points when I enter the ingredients. Is the 4 pats based on using the sugar free mix? I noticed there is no sugar listed in the nutritional facts for the recipe. The SmartPoints® calculator isn’t meant for recipes and will often give you the wrong points (usually higher) because it’s counting 0 points foods such as eggs, chicken, fruits and vegetables. So if you see a recipe with a SmartPoints® value that’s different from what the calculator tells you, that is why. You are amazing! …and so are these brownies! I am so making this for next get together we attend or host!